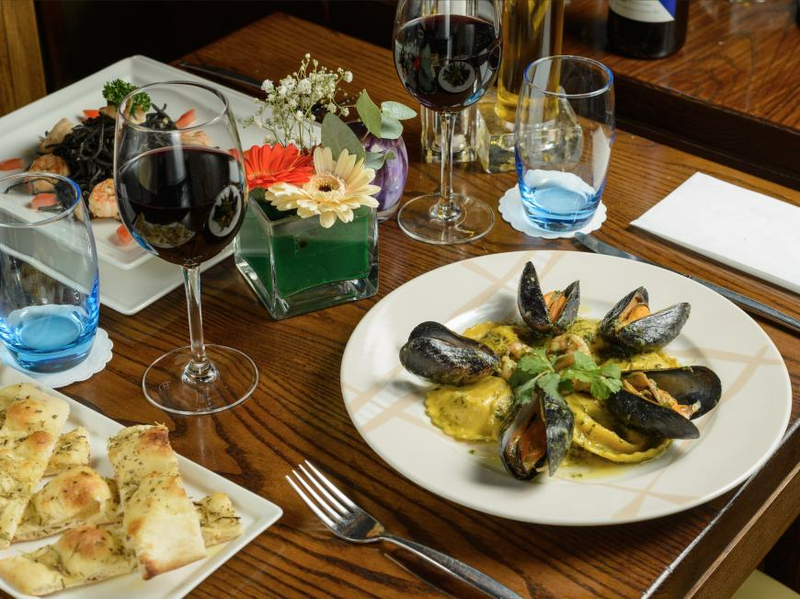 Just paces away from one of Dublin's busiest train stations, this pleasant coffee shop with pavement-side tables fronts one of the city's least known but most authentic Italian restaurants. Outdoor seating (pavement). Opening hours: Café Seats 30; Mon-Fri 7am-10pm, Sat 9am-10pm, Sun 10am-6pm. Restaurant, Seats 50: Mon-Sat 12-10pm. Pizza collection: Mon-Sat 12-10.Closed Sun. Mastercard, Visa. Just paces away from one of Dublin's busiest train stations, this pleasant coffee shop with pavement-side tables fronts one of the city's least known but most authentic Italian restaurants. Descend a broad staircase at the rear to find a smart Neapolitan neighbourhood style restaurant with old stone walls, dark wood tables and chairs and the typically open kitchen with busy chefs. Earthy dishes of the Campania region are the order of the day, like the polpettine vegetariane -- crisp caponata fritters stuffed with asiago cheese and served in spicy tomato sauce, or salcicche -- herby Italian sausages served on a bed of friarielli, a brined wild broccoli from the area around Naples. Seafood linguine comes with mussels, clams, calamari and prawns in white wine and dill sauce and Arborio risotto is enriched with porcini mushrooms and smoky pancetta. Pizzas are served in both café and restaurant, with a highly commended quattro formagi topped with asiago, buffalo mozzarella, gorgonzola and Parmesan. Sweet follow-ons are deftly handled classics of panna cotta, profiteroles and tiramisu as well as the hot and cold delight of the house affogato -- Italian ice cream with hot espresso laced with Amaretto. The extensive wine list is all Italian, featuring no less than four proseccos and three choices of grappa. Eight Italian beers are available and cocktail choices include Bellini and Campari variations. Repeat customers drawn by the friendly Italian staff as well as the generous portions mean that this hidden gem can be surprisingly busy even on weekdays so restaurant reservations are advisable. The commuter friendly café is open from 7 a.m., offering moderately priced moderate for snacks and light bites, and the restaurant, which is open from l2 noon, offers starters from around eight euro, mains from €18. City centre, near Westland Row station.